This lesson is focused on how a model forecast and the interpretation of that forecast, is affected by the basic design of the model. 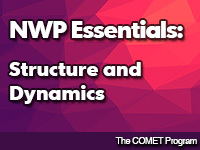 Topics include how meteorological variables are represented in grid point and spectral models, fundamental differences between hydrostatic and nonhydrostatic models, horizontal resolution of orographic and free-atmosphere features, vertical coordinate systems and how they affect the vertical resolution of features in the model forecast. Much of this lesson assumes that the user has already had education in NWP, and uses a lot of terminology that could have been briefly explained. Also, the quizzes are always really hard, this one especially. What makes them so hard are the 'check all that apply' questions and the 'is it X or Y; select from drop-down boxes' questions. If you get one sub-question wrong, the whole question is marked wrong. Partial credit on partly-right questions would go a long way toward making this fairer. Moreover, because you can't see what you put for a question you got wrong, you can't learn from your mistakes and you have to keep trying to get it right by trial and error. Great exercise. A refresher on some of the basic model essentials. Great way to learn, very interactive module. 2016/07/28 Updated the correct answer on one of the questions.